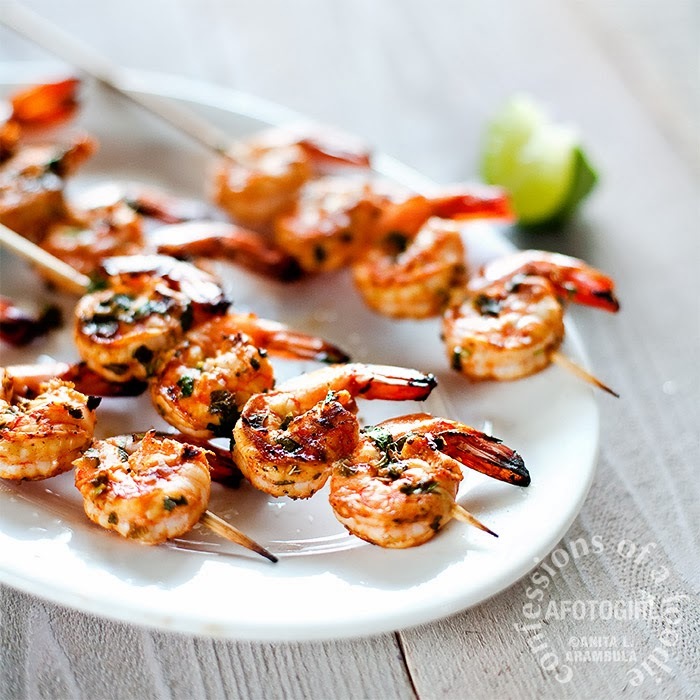 Tequila-Lime Grilled Shrimp made a shrimp lover out of this seafood hater. This is an easy recipe for two. 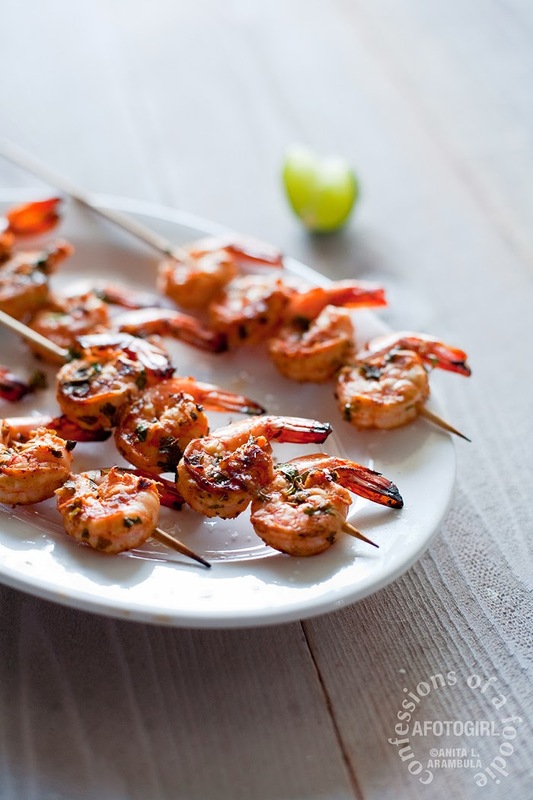 This Tequila-Lime Grilled Shrimp is easy to make and, considering I was not a shrimp eater the first time I had it and now love it this way, I'd have to say, it could quite possibly convert any non-seafood eating person into a shrimp eating person. There used to be a time where my very first reaction to anything from the sea – other than canned tuna – was "YUCK!" Growing up with a dad who's father/daughter time included early morning pier fishing, you'd think I'd have acquired a taste for seafood as a youngster. But I didn't. No, what I loved was the father/daughter time: Dad would take turns taking one of us three girls out (sisters 4 and 5 came later). He'd pack breakfast for us and I remember feeling so grown up because I got my very own thermos of hot chocolate. Then we'd head out before the sun came up while the rest of the house was still asleep. Other times it was a family affair and the whole lot of us would pile into the station wagon, each of us girls with our own fishing poles and we'd head to Mission Bay to fish and picnic. But even if we caught anything, us girls would never eat it. Any caught fish was for mom and dad. Especially after we'd catch a glimpse of dad cleaning the fish. The thought of eating it after seeing its life-force all over the chopping block dad used was just not something I'd easily forget. Nope. Us girls would have hamburgers or hot dogs on fish night. Fast forward to college where by the time I made it to the cafeteria for lunch, all that was usually left was tuna salad. Luckily, this was something I was familiar with. It came in a can. I never saw it whole. And best yet, it had a texture like chicken salad and not that opaque look of "real" fish. So tuna became a college staple. Then in my early 30s, my best friend and I discovered The Marine Room in La Jolla. It was much too out of our price range for causal dining but for quite some time, it did became our to-go-to place for birthdays. The first time we went, Dan ordered surf and turf. I ordered just the "turf." He coaxed me into taking a bite of his lobster tail. Prepared to be completely grossed out, I held my breath and went for it. It was like nothing I'd ever had before. What was this? Why hadn't I had it before? The next birthday there, I ordered surf and turf too. Next came my introduction to fish tacos. For a community known for them, it's a shame I waited until my mid-30s to try them. Again, it was because of Dan. He took me to happy hour at The Brigantine, a local seafood restaurant chain. They had $1.99 fish tacos on the bar menu. Crispy beer battered, they were over filled with cabbage, salsas, some kind of dressing reminiscent of thousand island dressing that the fish was all but camouflaged. And I loved them. A few months later, I started up on fish tacos from Rubio's which highlight the fish much more than the toppings and now enjoy them every lenten season. To be honest, there are still ways I won't eat shrimp. I will not eat it in pasta sauce. I do not like it cold with cocktail sauce. I do not like it scampi. And forget about serving it to me the day after it's been grilled. Ew. Shudder. The main players: 16 medium to large shrimp, peeled, deveined, tails on, Mexican Oregano, limes, garlic, cilantro and not pictured but nonetheless IMPORTANTE! -- tequila. 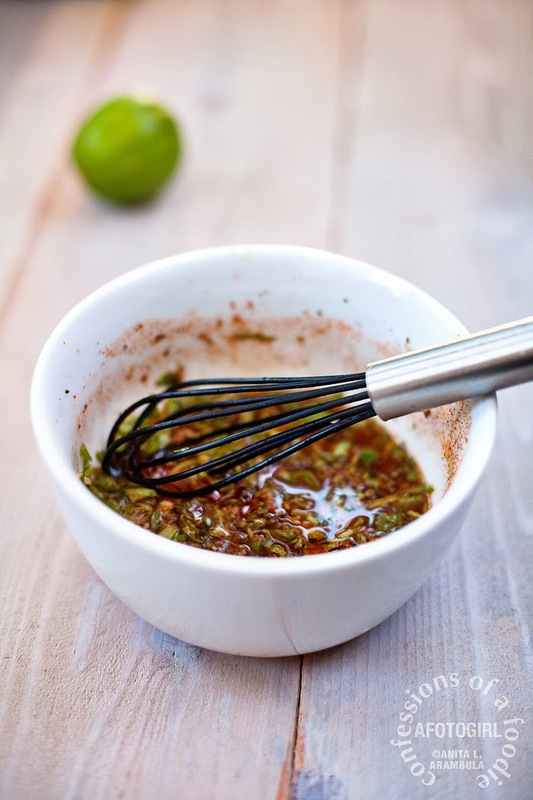 Make the marinade: Add the olive oil, tequila, lime juice, cilantro, garlic, chili powders and oregano into a small bowl. 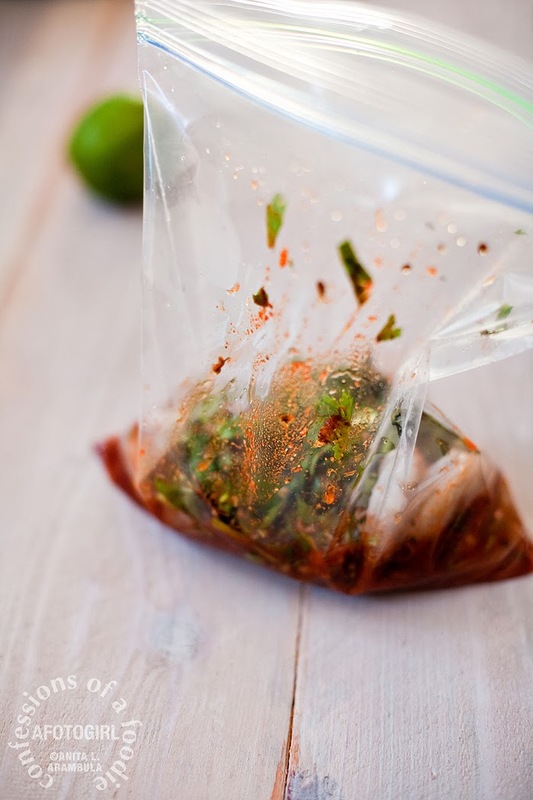 Marinate: Place the shrimp into a resealable baggie and pour in the marinade. Place in refrigerator and let it sit around and get happy for about 30 minutes. Skewer me baby! 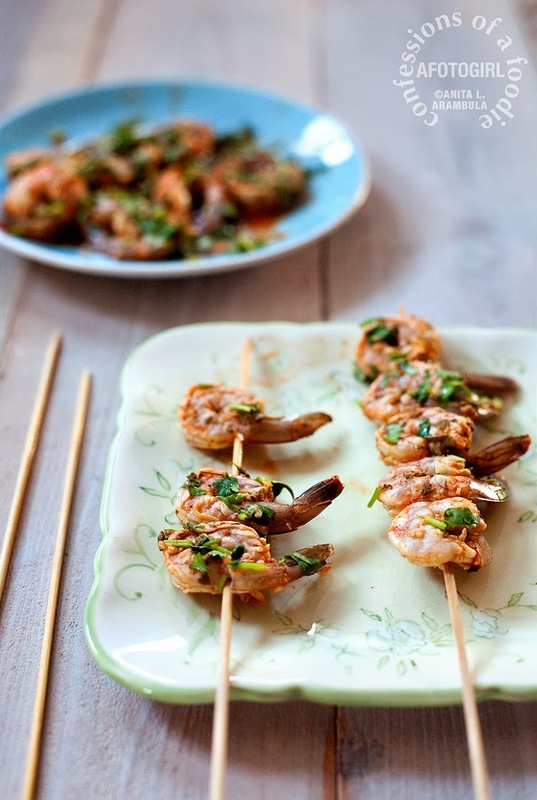 Thread the shrimp onto bamboo skewers that have soaked in water for at least 30 minutes beforehand. 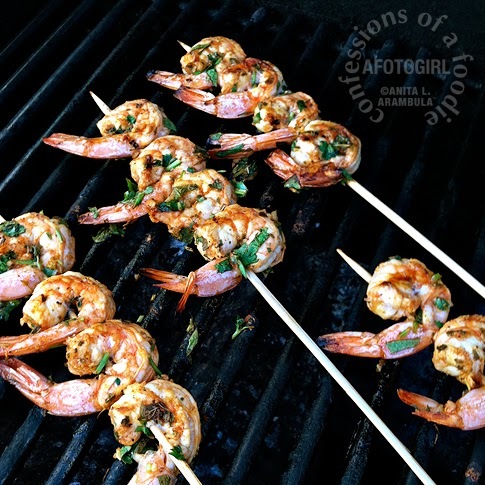 Grill: Place on a hot grill and cook for 3 minutes on each side or until shrimp is pink and opaque. Place shrimp in a large ziplock bag. Set aside. In a small bowl, add the next eight ingredients. Place the oregano in the palm of your hand. Rub hands together over bowl to crush leaves and flower buds. This releases the essential oils from the oregano. Use a whisk to combine well. Add to shrimp. Refrigerate for 30 minutes. Heat grill to hot (450˚F). Thread 4 shrimp onto a skewer. Continue until all shrimp is threaded. Place on grill and cook for 3 minutes with lid open. Carefully flip shrimp using tongs. Cook for 3 minutes on this side or until shrimp is bright pink and opaque. Remove and serve immediately. As for loving fish in general. Well, I'm still not there yet. I don't like salmon. But I do have a new-found appreciation of good fresh fish & chips. I wrote about enjoying them during my Pacific Northwest Adventure here and a while back at a local restaurant here. YOUR TURN: Are there any foods that you absolutely hated as a kid but love now? I just can't watch it because the food pictures are so delicious it is just mouthwatering. 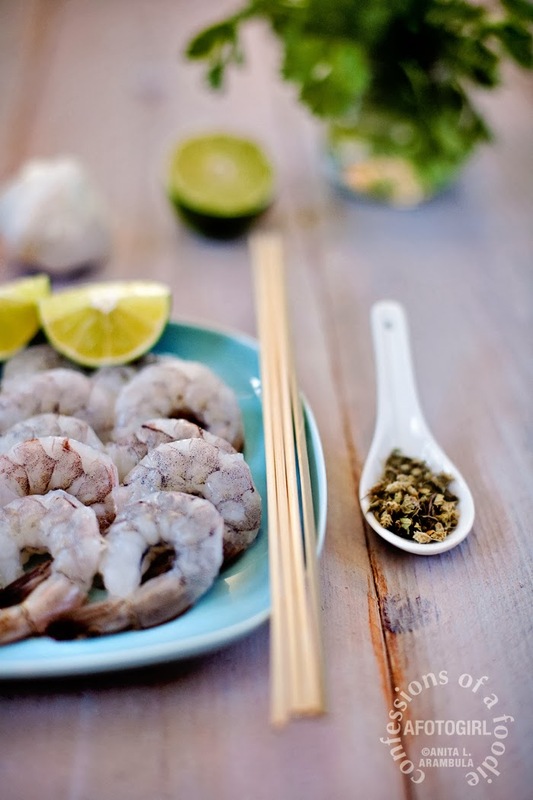 Wow, the shrimp looks so tasty and the photographs are awesome. Off Topic: Do you sell the food pics you take as stock? @Jim, I have not to date but am not ruling out licensing down the road. looks amazing im going to make these shrimp and put them in soft tacos, add some mexican rice and a mango-pineapple salsa. I've done that and it's delish served that way! Enjoy! Mmm, I'm a big fan of shrimp ;) Glad you decided to change your mind about seafood! The Marine Room is a great place to start. I love the story about you fishing with your dad. i did the same thing as a girl and still do when I go back to visit in Indiana. This shrimp looks divine. 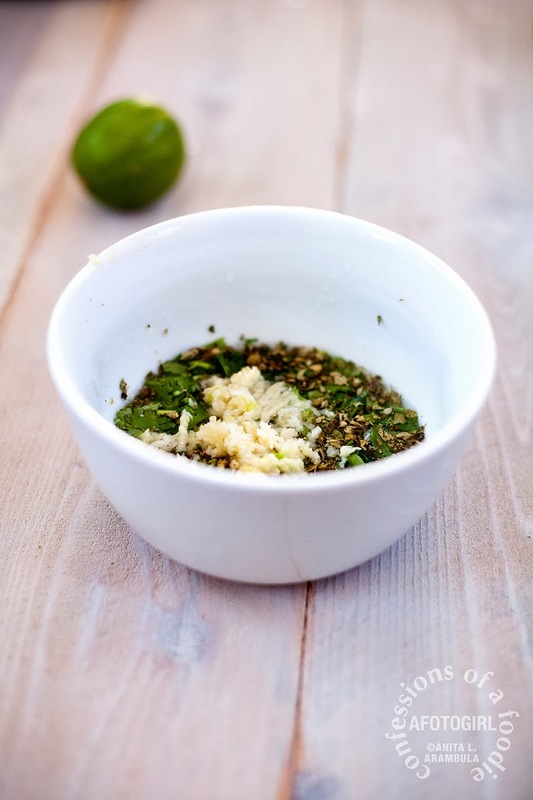 Tequila lime is a perfect complement! These shrimp look absolutely amazing! OMG I wish I could eat shrimp the way I used to! These would be excellent to make for my husband though! Great recipe!